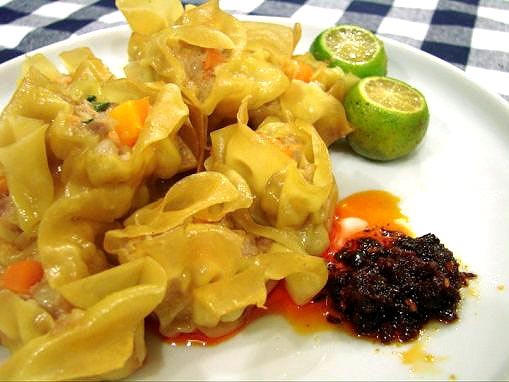 Philippines version of siomai (Shaomai) is often ground pork, beef or shrimp, and usually combined with green peas, carrots and nicely wrapped in wonton wrappers. The ground meat should have some fat otherwise the cooked siomai will be too tough. It is either steamed or fried resulting in a crispy exterior. Siomai, is a dimsum of Chinese origin. Siomai is now a part of Filipino foods and recipes culture. It is often seen sold at the streets, restaurants and fast food chains. This siomai recipe can take up to more or less, 50 minutes including the preparation and cooking. 1). Beat egg and mix with flour till free of lumps. 2). Bring water, cooking oil and salt to a boil, then pour in flour. 3). Remove from heat and beat until mixture forms a ball. 4). Divide the dough into 1 1/4 -inch balls. 5). Roll each ball on a floured board until paper thin. Set aside. 1). Mix all the ingredients for the filling in a bowl. 2). Spoon 1 tablespoon of mixture into each wrapper. Fold and seal. 3). Meanwhile, boil water and brush steamer with oil. 4). When the water gets to a rolling boil, arrange the siomai in the steamer and let stand for 15-20 minutes, longer for larger pieces. After steaming for 20 minutes, you may now serve your siomai. It is perfect with soy sauce, calamansi and sesame oil. The chilli paste is optional. Combine chopped chillies and minced garlic then simmer for around 20 minutes or till most of the water has evaporated. Add oil, simmer and stir well. Now you can eat and enjoy your siomai; the Pinoy style. and what i love about this, is that you incorporate the recipes for siomai wrapper & chili sauce in this post, learned alot! I tried to cook siomai months ago but had a problem with the wrapper. I bought the prepared, frozen ones at a supermarket and it melted while steaming. Might try to do my own wrapper next time. Thanks for the recipe!